The Federation of Bosnia and Herzegovina (Bosnian, Croatian and Serbian: Federacija Bosne i Hercegovine, Cyrillic script: Федерација Босне и Херцеговине; [federǎːt͡sija bôsneː i xěrt͡segoʋineː]) is one of the two political entities that compose Bosnia and Herzegovina, the other being Republika Srpska. 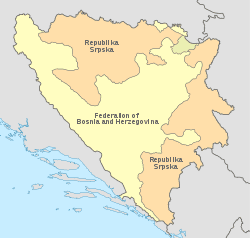 The Federation of Bosnia and Herzegovina consists of 10 autonomous cantons with their own governments. 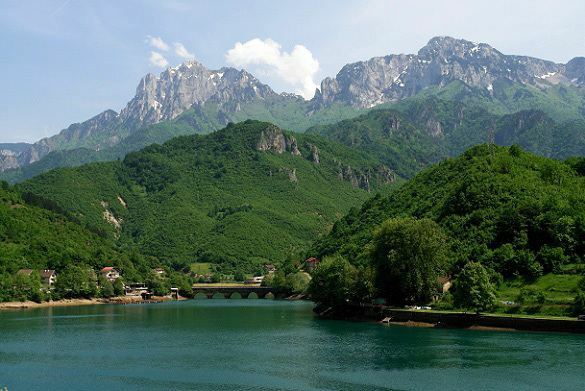 It is inhabited primarily by Bosniaks and Bosnian Croats, which is why it is sometimes informally referred to as the Bosniak-Croat Federation (with the Bosnian Serbs as the third constituency of the entity). 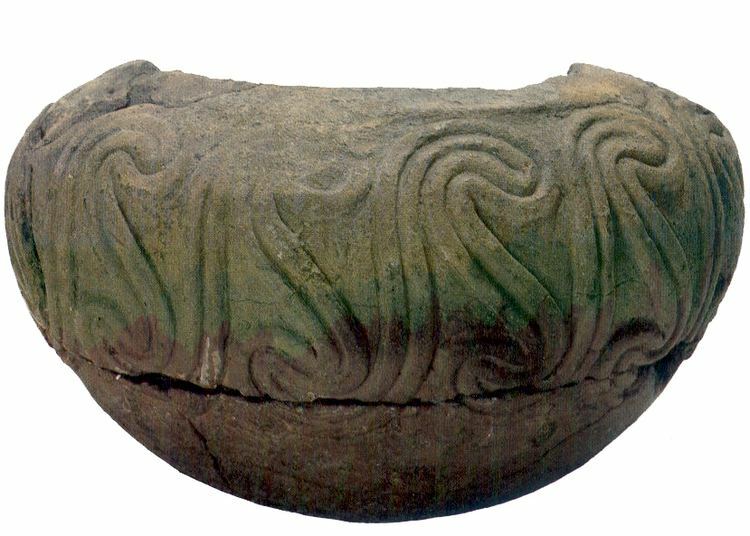 It is sometimes known by the shorter name Federation of B&H (Federacija BiH). The Serb-dominated Yugoslav People's Army attacked Croatia from Bosnia and Herzegovina. Their first target was Croatian village Ravno that was attacked on 2 November 1991 and completely destroyed. 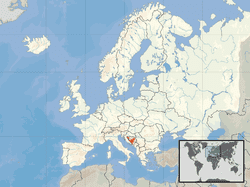 Yugoslavia effected an economic blockade of Bosnia and Herzegovina, thus trying to keep it as part of Yugoslavia. Later, Yugoslavia claimed territory of Bosnia and Herzegovina with a Serb majority and the capital Sarajevo. Serb Republic of Bosnia and Herzegovina was declared on 27 March 1992 with the goal to incorporate parts of Bosnia and Herzegovina into Yugoslavia. The objective of Serbian politics in Bosnia and Herzegovina was to unite Serbian autonomous provinces into a single unit that would join Yugoslavia, and with total blockade of Sarajevo, break Bosnia and Herzegovina into smaller, unconnected and hardly defensible enclaves. Because of superiority in armaments, support from Belgrade and an embargo on the importation of arms into Bosnia and Herzegovina, the Serbs achieved their goals by June 1992. The Vance-Owen plan was presented in January 1993. 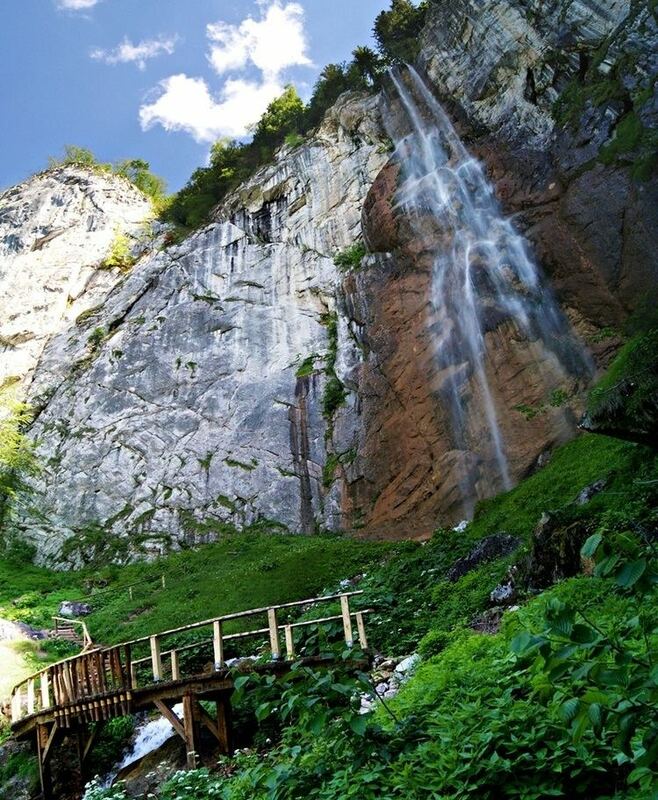 It was planned to create 10 cantons on the territory of the whole of Bosnia and Herzegovina. This plan increased conflict between Croats and Bosniaks. The Army of the Republic of Bosnia and Herzegovina (ARBiH) launched four offensives and conquered a large area which was under control of HVO; almost the whole Central Bosnia (except Novi Travnik, Vitez, Busovača, Kiseljak, Kreševo and Žepče and the wider areas around those towns and Usora, part of Municipality of Travnik, Zavidovići and part of Municipality of Vareš) and part of Herzegovina, Konjic, Jablanica and eastern and northern parts of Mostar. A number of crimes against civilians were committed on both sides. Hostility between Croats and Bosniaks ended with mediation by the United States and the signing of the Washington Agreement on 18 March 1994. The cooperation between Croats and Bosniaks was renewed, and the Federation of Bosnia and Herzegovina, a Bosniak and Croat controlled area was established. 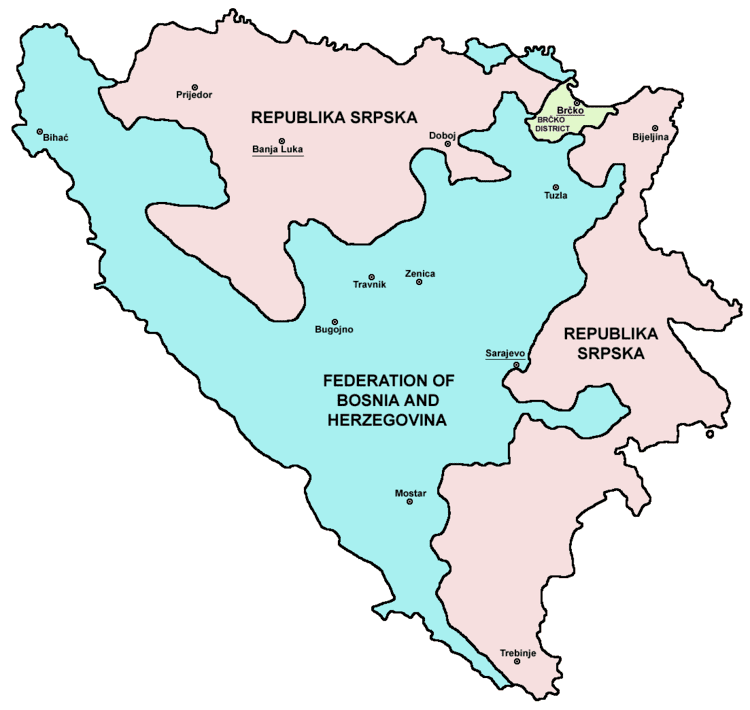 There was also a proposal to create a confederation of Federation of Bosnia and Herzegovina and Republic of Croatia. The joint command of ARBiH, HVO and Croatian Army (HV) was established in March 1995. The closer cooperation between Croats and Bosniaks was made through the Split Agreement where Bosnia and Herzegovina's Muslim leaders allowed the Croatian Army to free western part of Bosnia and Herzegovina with cooperation with ARBiH. After the Operation Storm, the Serbian hoop around Bihać was broken and Croatian and Bosnian armies continued to liberate western Bosnia. The UN unsuccessfully tried to establish peace in Bosnia and Herzegovina by trying to create a successful structure for Bosnia and Herzegovina. The UN showed a total inability when Serbs conquered UN-protected towns, Srebrenica and Žepa. Serbs launched an attack on the UN-protected town of Bihać, but they were stopped by the Croatian army during Operation Storm. Joint Croatian-Bosnian military successes made peace negotiations possible. The Federation of Bosnia and Herzegovina was formed by the Washington Agreement of March 1994. Under the agreement, the combined territory held by the Army of the Republic of Bosnia and Herzegovina and the Croatian Defence Council forces was to be divided into ten autonomous cantons. The cantonal system was selected to prevent dominance of one ethnic group over another. However, much of the territory Croats and Bosniaks claimed for their Federation was at that point still controlled by the Bosnian Serbs. In 1995, Bosnian government forces and Bosnian Croat forces of the Federation of Bosnia and Herzegovina defeated forces of the Autonomous Province of Western Bosnia, and this territory was added to the federation. By the Dayton Agreement of 1995 that ended the four-year war, the Federation of Bosnia and Herzegovina was defined as one of the two entities of Bosnia and Herzegovina and comprised 51% of country's area. The Republika Srpska comprised the other 49%. Cantons and federal structure were built rather slowly after the war. Croatian institutions of Herzeg-Bosnia existed and functioned parallel to Federation ones up until 1996-97, when they were phased out. On 8 March 2000, the Brčko District was formed as an autonomous district within Bosnia and Herzegovina and it was created from part of the territory of both Bosnian entities. Brčko District is now a condominium that belongs to both entities. In 2001, the Office of the High Representative in the country imposed amendments to the Federation's constitution and its electoral law, complicating its structure and impairing the parity between Bosniaks and Croats that was up until then in force in the Federation. Dissatisfied Croat politicians set up a separate Croatian National Assembly, held a referendum parallel to the elections and proclaimed Croatian federal unit in Croat-majority areas in the Federation. Their attempts ended shortly after a crackdown by SFOR and legal proceedings. Since Bosniaks compose roughly 70.4% of Federation's population, Croats 22.4% and Serbs just around 2%, Parliament's House of Peoples (with equal representation for all three nationalities) is supposed to ensure that the interests of Croats, Serbs and national minorities are fairly represented during government creation and in the legislative process. Since 2001-02 and foreign-imposed amendments to the constitution and electoral laws, Bosnian Croats have claimed the election system for the deputies in the House of Peoples is rigged, depriving them of their rights to representation and in fact enabling Bosniaks to control the majority in the upper house as well. Namely, after 2002 each nations' deputies to the House of Peoples are elected by 10 Cantonal assemblies, 6 of them with clear Bosniak majority. This dismantled checks the Federation's Croats and Serbs had on the Federal legislature as well as the executive, particularly government-building. In 2010-14 Federation's Government was formed by Bosniak SDP without the consent of major Croat political parties. After Croatian politician Božo Ljubić filed an appeal, in December 2016 Constitutional Court of Bosnia and Herzegovina found the election system of the deputies in the House of Peoples unconstitutional and abrogated the controversial rules. Federation is also divided into ten highly autonomous cantons, which are in fact federal units. They each have their own governments, assemblies and exclusive competencies. After Croats' appeal, Federation's Constitutional Court ruled in 2010 that the two Federation's ministries - Ministry of Education and Science and Ministry of Culture and Sports - are unconstitutional since education and culture are an exclusive competence of cantons, not the federation.